Haynie’s request was for approval of construction of a second aeration basin next to the one currently under construction at the Calls Creek wastewater treatment plant on the north side of Watkinsville. At the beginning of the meeting, Board Chairman Daniell announced that Haynie will be leaving his position on March 5 to return to private business. The Board also decided to go forward with consideration of revisions to its Landscaping and Buffers section of its Unified Development Code. At the Open House discussion on the Water and Wastewater Master Plan Update on Jan. 16, Haynie told citizens he had three questions he wanted them to address. He said he wanted to know if citizens wanted to expand wastewater service by extension of the gravity sewer line system and if citizens wanted to maintain the current wastewater treatment capacity allocations, which allocate limited capacity to residential use. The third question was whether the county should include wastewater reuse as a strategy for drought management. Haynie left little doubt that he favored reuse, but citizens at the meeting provided little feedback on that topic, focusing instead on the gravity sewer line question. At the meeting Tuesday night, Haynie acknowledged that the Water and Wastewater Master Plan still was not complete and would not be released to the public and come before the Board for approval until some time in the future. Haynie and Oconee County Board of Commissioners Chairman John Daniell had said the Public Hearing at the Civic Center on Jan. 16 was intended to get citizen feedback before the plan was finalized. 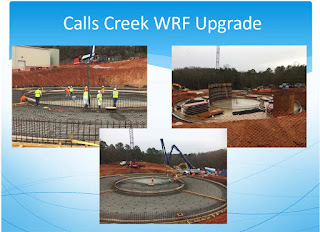 Haynie told the Board on Tuesday night that Crowder Construction Company of Conyers, contractor for the $13.4 million upgrade of the Calls Creek plant now underway, currently is pouring concrete and doing other work on an aeration basin that is the centerpiece of the new biological treatment process. A second clarifier, which is at the center of that aeration basin, also is being built, and it would be cost effective to build the “doughnut” that would surround that clarifier to complete the second aeration basin, Haynie said. Haynie asked the Board to add $1,030,933 to the Crowder contract and extend the contract completion date to 550 days from 460 to allow for the additional work. The work on the remainder of the remainder of the project still would need to be completed by Aug. 4, Haynie said. That work will upgrade the existing plant from its current .667 million gallons per day of treatment capacity to 1.5 million gallons per day. 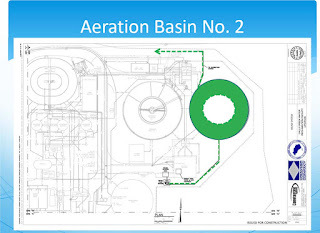 Haynie said construction of the second aeration basin would add 1.3 million gallons of holding capacity to the plant. Water that the water the plant produces for reuse could be held in that tank, he said. In addition, the plant itself could use the treated water in its operation, saving on use of treated water, according to Haynie. When the county upgrades the current Calls Creek plant to 3.0 million gallons per day, the second aeration basin will needed for treatment, Haynie told the Board. Haynie said he had money available in reserve from the 2017 sales of bonds to finance water and sewer projects in the county. Haynie told the commissioners that the current wastewater treatment plant is using 160,000 gallons per day of treated water from the county’s potable water system, making the plant itself second only to the Board of Education as a consumer of drinking water. The plant could switch to reuse water, saving that demand on the treated water system, he said. In addition, Haynie said that Oconee Veterans Park is using 26,000 gallons per day of water and Herman C. Michael Park is using 7,000 gallons per day. Both parks are on Hog Mountain Road, and the county would need to run a reuse line to them to supply reuse water. Haynie said those figure will increase in the future, and he also believes there will be agricultural demand for reuse water along Hog Mountain Road. Haynie said the development of a reuse program would be one step toward getting rid of the extra reuse water created by expansion of the Calls Creek wastewater plant to 3 million gallons per day. He projected future reuse demand for reuse water by the wastewater treatment plant, the two parks, and agriculture to be more than 440,000 gallons per day. The Board of Commissioners gave tentative approval to two additional requests from Haynie. The Board agreed to change the terms of a $1.9 million contract with Griffin Brothers Inc. of Maysville for an upgrade of the pressured sewer line from Epps Bridge Parkway at Parkway Boulevard to the Calls Creek plant. The change will move the completion date back two months to July 3 to accommodate disruption in the manufacturing of the PVC pipe due to Hurricane Harvey. The Board also gave tentative approval to two separate contracts for construction of an elevated storage tank and related system improvements to serve the northwest section of the county, including the new Dove Creek Elementary School under construction on Hog Mountain Road between Osborne Road and Dewey Road near the Barrow County line. Haynie recommended awarding a $822,080 contract to Phoenix Fabricators, of Avon, Ind., for construction of the tank and $205,500 to Allsouth Constructors, Covington, for construction of a booster pump station to fill the tank. Both items were put on the consent agenda, meaning they will be approved next week without further discussion unless a commissioner asks that the item be taken off the consent agenda. Haynie was hired as director of the Utility Department in August 2015 to fix problems at the Calls Creek plant and companion Rocky Branch Land Application Site. A engineer, Haynie has been in the water engineering industry since 1982, when he graduated from Georgia Tech. Prior to joining Oconee County, Haynie was regional water practice manager at Burns and McDonnell of Alpharetta. Haynie replaced Chris Thomas, who resigned in June of 2015 following a series of problems at the county’s two water treatment facilities. County Administrator Justin Kirouac asked the Board if it wanted to move forward with consideration of changes in the section of the county’s development code dealing with landscaping and buffers. At the Jan. 23 Town Hall Meeting, citizens called for action on the code revision, arguing, among other things, that he current code has sections that contradict each other, that spacing of trees is a problem, and that the county needs regulations creating larger islands in parking lots and better drainage in those islands. Kirouac noted that Board of Commissioners Chair John Daniell had said consideration of changes to the Unified Development Code would not take place until after the county completed work on its Comprehensive Plan this spring. Kirouac said he felt the changes being suggested were not so complex and that the section of the code stood pretty much on its own. The Board, without a formal vote, indicated Kirouac should proceed with considerations of changes to the code. The county got a positive report from accounting from Treadwell, Tamplin and Co, certified public accountants based in Madison, which audits county fiscal matters. The Board, on the advice of County Attorney Daniel Haygood, imposed a one-week moratorium on the issuance of sign permits so the county can revise its sign ordinance in light of unspecified developments in regulation of signage. The Board approved spending $25,000 to address problems of flooding at the Animal Shelter in the south of the county. Board Chair Daniell announced that Pat Hayes, director and chair of the Board of Elections and Registration, will retire on March 2. Daniell also announced that a Public Forum will be held on the revised 2018 Comprehensive Plan for the county at 6 p.m. on Feb. 5 at Oconee Veterans Park on Hog Mountain Road. The video below is of the entire Board of Commissioners meeting. Kirouac began the discussion of landscaping and buffers at 4:47 in the video. Haynie began his presentation on the three sewer projects starting at 9:13. OCO: BOC 1 30 18 from Lee Becker on Vimeo.